George and I visit restaurants throughout the Okanagan region, particularly during the winter season, to come up with some great recommendations for our guests. Last week we were at the Nest & Nectar where we enjoyed a delicious vegan dinner: started with ‘home-made” tortilla chips with chickpea salsa – delicious! 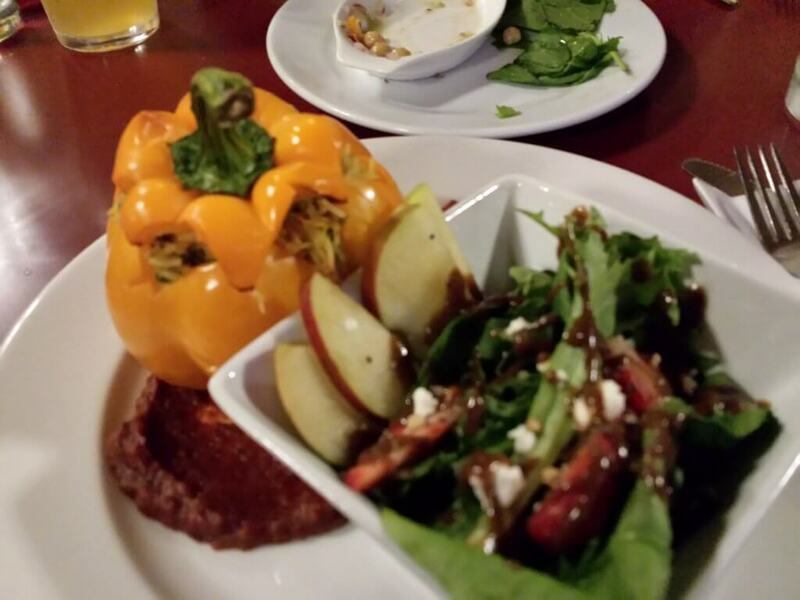 The main course, pictured here, was roasted pepper stuffed with brown rice, mushrooms and fresh asparagus. This was plated with a spicy tomato vegetable sauce and a crunchy salad. The dessert was a plate of fresh fruit including grapes, dragon fruit, vegan cheese, whole food crackers. A great finish to a very pleasing meal! We stayed for the theatre production of “Death by Design” by the Many Hats Theatre group. A good one!